You’ve been dreaming about your big day for as long as you can remember, right down to the last rose petal. Every time you run through it in your head, it’s absolutely perfect; from the dress to the cake to the… 100 white doves? In reality, getting hitched without a hitch requires a lot of careful planning and a wedding day schedule that leaves nothing to chance. To ensure your special day is remembered for all the right reasons, consider these points when putting together your wedding day schedule. Before you walk down the aisle, you’ll want to make sure your bridal jewelry is every bit as radiant as you are. There are a number of things you can do to make your diamond engagement ring and wedding ring look sparkly clean. While the correct cleaning method will depend on the type of ring setting you choose, as a general rule, it’s okay to soak your rings for up to 30 minutes in mild dish soap and warm water, and scrub them gently with a soft toothbrush. Let your bridesmaids have their hair and makeup done before you. Not only will you stay looking fresh for the ceremony, but you’ll also be able to have your bridesmaids in the background of your getting-ready shots. Your wedding day schedule should allow for an hour and a half to two hours for the bride’s hair and makeup, and an hour to an hour and a half for each of the bridesmaids. Typically, the groom and groomsmen arrive at the venue an hour and a half prior to the ceremony. This allows them time to welcome guests and show them to their seats… and get those wedding-day jitters under control. With your hair and makeup done and jewelry shined, it’s time to let the groom see his beautiful bride! You might want to use this quiet moment to take pre-ceremony portraits while your bridal party and families wait in the wings. You should allocate around 15 to 30 minutes of your wedding day schedule for the first look; 40 if you factor in bride and groom photos. Think about how you want your family and friends grouped in photos and prepare a list for the photographer. So there’s no confusion, you can also ask someone from your bridal party to help the photographer identify all the people on the list. Your wedding day schedule should allow up to 50 minutes for photo ops. Wedding Day Schedule: It’s Showtime! Plan to start the wedding ceremony fifteen minutes after the time listed on the invitation, as there will always be latecomers. After you’ve exchanged vows, it’s off to the reception. Yay! You know how this part goes: cocktails are drunk, dinner is served, dances are danced, toasts are made, the cake is cut, a bouquet is tossed, and you make your grand exit. Whichever moments you choose to include in your wedding day schedule, try not to get too caught up in the details; allow yourself space to enjoy what is sure to be one of the best days of your life. Once you’ve kicked off your dancing shoes and picked the last bit of confetti from your hair, you’ll probably be ready to call it a night. At this point, you might be tempted to toss your shiny new engagement ring and wedding ring into a drawer or leave them lying precariously on your nightstand – but they need a bed for the night too! It’s important to store your diamond jewelry separately from other jewelry, as they can scratch pretty much any jewel they come into contact with, diamonds being the hardest mineral on Earth and all. You’re best off keeping your sparklers in their original packaging or, if you prefer, in a separate compartment in a jewelry box. For more information on keeping your precious pieces in pristine condition, read this article on caring for your diamond jewelry. If you have yet to purchase your wedding ring, this blog post explains How to Match Your Wedding Ring and Engagement Ring. 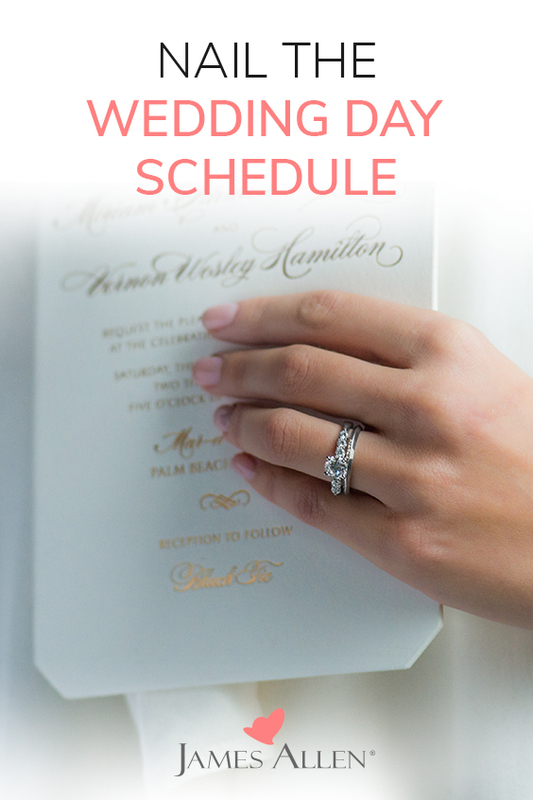 Do you have any other tips for putting together a wedding day schedule? Let us know in the comments below or on our social channels: Instagram, Facebook, and Twitter.